You will love these holiday pralines from scratch as much as I do. Buttery, melt in your mouth - fantastic. Offering many old fashioned holiday recipes for you to call your own. Lightly grease inside of a 4 quart saucepan. Line a baking sheet with waxed paper. Place the pecans in a skillet and heat on medium until lightly golden and smells wonderful. Stir both sugars, baking soda, sour cream and corn syrup together in the oiled saucepan over low heat. Cook and stir continually until the sugars are dissolved. Wipe any sugar crystals above the liquid line with a brush moistened with water. Raise heat to medium-high. Once the sugar syrup begins to boil, do NOT stir. Heat to 240 degrees , or when a small amount of syrup dropped in a cold glass of water forms a soft ball that flattens when removed from the water, and placed on a flat surface. Remove from heat and stir in butter, vanilla and chopped pecans. Drop spoonfuls of the mixture two inches apart onto the prepared baking sheet. Press a pecan half into the top of each praline, and allow to cool completely. Store in an airtight container in a cool place. This makes 24 pralines. 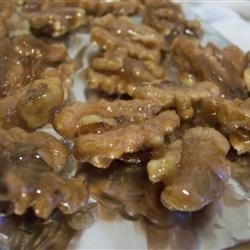 I have more than holiday pralines from scratch, check out more holiday nut recipes below. 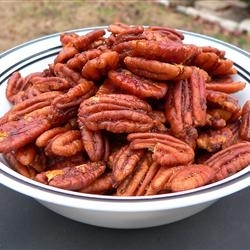 These homemade buttered pecans are great over puddings, ice cream or even biscuits; the pecans are quick to make and so good to have on hand. Line a plate with double thickness of paper towels and keep it near the stove. Put a small skillet over medium heat and toss in the pecans. Cook and stir for 1 minute, or until they are slightly toasted. Add the butter and continue to cook, turning, until the pecans have absorbed almost all of the butter; approximately two more minutes. Remove the pan from the heat, add the salt and turn the pecans out onto the paper towels. Cover with another double layer of paper towels and pat to gently remove some of the excess butter. Cool to room temperature. PREHEAT oven to 325 degrees. Wrap foil on top of a baking sheet and spray with oil. Combine brown sugar and seasonings in a small bowl. Whisk the egg white in another bowl until foamy; add nuts and toss to coat. Add spice mixture and toss. Spread on the prepared pan and bake for 20 to 25 minutes or until light brown, stirring occasionally. Cool completely. Store in an airtight container. Makes 2 cups. *Apple pie spice works great too. Mix together and store in a container with a tight fitting lid. Makes 8 tablespoons. You may use skinned salted or unsalted peanuts, blanched almonds, walnuts, pecans, macadamias or pistachios. Line a baking sheet with parchment paper, or better yet, a silicone mat. Put the sugar and water in a heavy bottomed saucepan and cook over medium-high, stirring with a wooden spoon, until the sugar dissolves. Keeping the heat fairly high, cook the sugar, without stirring, until it just starts to color. Toss in the nuts and immediately start stirring. Keep stirring, coating the nuts with syrup. Within a few minutes, the nuts will be covered with sugar and will turn white - keep stirring until the sugar turn into caramel. When the peanuts are coated with a nice, deep amber caramel, remove the pan from the heat and turn the nuts out onto the baking sheet. Use a wood spoon to spread the nuts out as best you can. Cool to room temperature. When they are cool enough to handle, separate them and break them into small pieces or pulverize them in a food processor. Now that you have made holiday pralines from scratch, please visit the holiday candy recipes below.